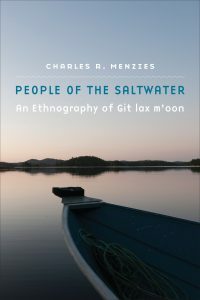 In People of the Saltwater, Charles R. Menzies explores the history of an ancient Tsimshian community, focusing on the people and their enduring place in the modern world. The Gitxaala Nation has called the rugged north coast of British Columbia home for millennia, proudly maintaining its territory and traditional way of life. People of the Saltwater first outlines the social and political relations that constitute Gitxaala society. Although these traditionalist relations have undergone change, they have endured through colonialism and the emergence of the industrial capitalist economy. It is of fundamental importance to this society to link its past to its present in all spheres of life, from its understanding of its hereditary leaders to the continuance of its ancient ceremonies. Menzies then turns to a discussion of an economy based on natural-resource extraction by examining fisheries and their central importance to the Gitxaalas’ cultural roots. Not only do these fisheries support the Gitxaala Nation economically, they also serve as a source of distinct cultural identity. Menzies’s firsthand account describes the group’s place within cultural anthropology and the importance of its lifeways, traditions, and histories in nontraditional society today.